Telly Award Winner, IMA Awards Nominee, Producer, Author & Music Entrepreneur, Anthony Rodriguez, stops by to chat with Dini Mussolini about his book, "The Musician" and Latin Tribute to MaryMary's gospel song, "Shackles". Set your reminders, it's happening! 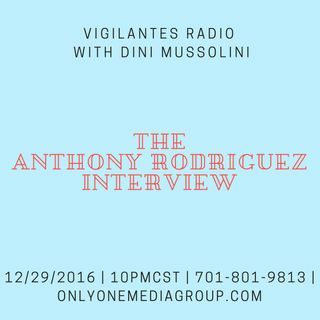 12/29/2016 | 10PMCST | 701-801-9813 | or via the browser by going to www.onlyonemediagroup.com/vigilantesradio and slapping that "Go LIVE!" button.